PT Telkom Akses - PTTA or referred to as "Telkom Akses" is an established information technology (IT) company under Telkom Group. PT Telkom Akses is a subsidiary company of PT Telekomunikasi Indonesia Tbk (Telkom Group), the largest state-owned telecommunication services companies in Indonesia. At present, Telkom Akses is 100% owned by Telkom Group. Telkom Akses has core business focus in 3 business pillars; construction, managed services and trading in the field of telecommunication. Its business include broadband network installation, network terminal equipment (NTE), and operation & maintenance (O&M). Telkom Akses was incorporated on 26 November 2012 and commercially operate on February 2013. 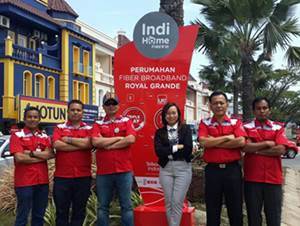 Headquartered in Jakarta, Telkom Akses now has 5 regional areas spread across Indonesia; regional area Sumatera, regional area Jakarta - Banten, regional area West Java - Central Java, regional area East Java - Bali - Mataram - Kupang and regional area Kalimantan - Sulawei - Maluku - Papua. In term of financial performance, PT Telkom Akses records strong total assets growth in 2015. According to Telkom Group Annual Report 2015 as cited by JobsCDC.com, Telkom Akses registered total assets of Rp 3,696 billion in 2015. This reflected an 76.92% increase from Rp 2,089 billion in 2014. Minimum Bachelor Degree (S1) majoring in Mathematics, Science and Technology or equivalent. The Candidates with background in Technology Information (Programming, System Security and Statistical Science) is preferred. Be a clear, confident and persuasive communicator, with excellent presentation skills and with the ability to structure a coherent, logical argument and the confidence to defend assumptions, projections and recommedations. Demonstrate a keen interest in and fair understanding of big data technology and the business trends that are driving the adoption of this technology. Strong sense of analytical thinking and good problem solving skills. Strong organizational and people skills, able to work independently and appropriately prioritise between competing opportunities. Familiar with SQ is a must. Willing to work in West Jakarta. JobsCDC.com now available on android device. Download now on Google Play here. Please be aware of recruitment fraud. The entire stage of this selection process is free of charge. PT Telkom Akses - Fresh Graduate Data Scientist Telkom Group December 2016 will never ask for fees or upfront payments for any purposes during the recruitment process such as transportation and accommodation.